While Muya restaurant is closed, they are still running vegan pop ups and supper clubs around London. Find details of events at muyaethiopianvegan.com. 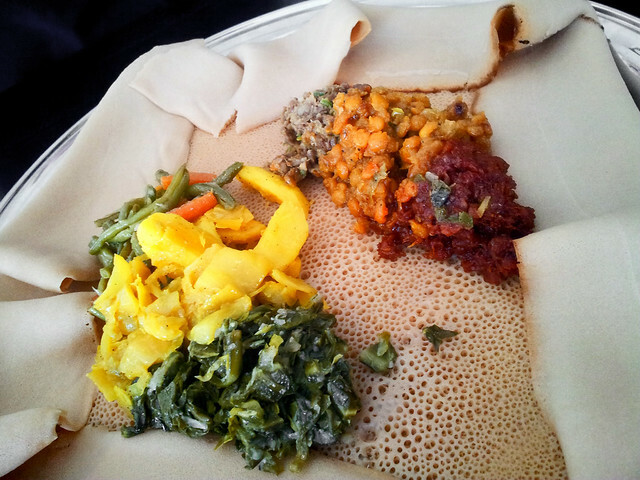 If you’re vegan and you’ve yet to try (or are eager for more) Ethiopian food, make this your new go-to London source. All of the vegetarian menu items are vegan, and the stews can also be made so (even better, they’re adding more specifically veg options to the menu). Concerning taste, everything is spot-on (be sure to try the miser wot, a rich and tangy red lentil dish) and the staff member to whom we talked was both knowledgeable and excited about the food (which ought to be the case with anyone who works with food but surprisingly isn’t). Prices are very reasonable but portions are almost excessively generous, so go with an empty stomach! Muya‘s vegetarian platter comes with a selection of six different dishes from the veggie menu, all selected by the chef. Based on the six we were served I’m confident anything on the menu would be exquisite. A well rounded medley, nothing too spicy, including pulses, various greens, and potatoes, comprised the set. The azifa and miser wat were two of my favourites, but I’m an unapologetic fan of collards too, leaving the greens to also rank high. Everything was good; let’s just leave it at that. The restaurant is only a few doors down from The Third Estate and Bumblebee (an ace organic whole foods shop with loads of vegan goodies), so you can hit a few spots in one shot. Incidentally, if you’re interested in vegan Ethiopian food then I highly recommend Papa Tofu Loves Ethiopian Food by Kittee Berns. Kip, I want to eat what you eat. Another terrific place is Mosob on Harrow Road in W9. It’s Eritrean and they have a vegan menu as well. Love your blog! Also if you’re in south london check out Zeret Kitchen off Camberwell rd. Vegan platter to share (same items) for 7.50. Such friendly owners too they brought us special Ethipian coffee on the house to finish the meal. Excellent, thanks! I’ll definitely check it out (I’m in that part of town often).